A business consultant argues for the importance of learning through human interactions rather than always emphasizing computer-generated data. Producing a mixture of how-to text and trenchant philosophy, Madsbjerg illustrates his formula for problem-solving with rich, captivating anecdotes, many of them mini case studies. The author clearly explains his bafflement at the devaluation of individual human judgment based on close observation followed by analytical thought. Madsbjerg is no Luddite—he fully understands the value of data generated by algorithms—but he feels certain that one finely tuned human mind can solve problems that are beyond the grasp of emotionless computers. The author’s concept of “sensemaking” includes five steps: understanding the culture in which businesses are trying to sell their products and services; relying on data that is collected via human observation rather than just preprogrammed algorithms; viewing individual behavior in a natural rather than a compromised setting (“the savannah—not the zoo”); trusting the kind of creative insights that qualify as sudden revelations; and using tools from the natural world, supplemented by computer data, rather than vice versa. 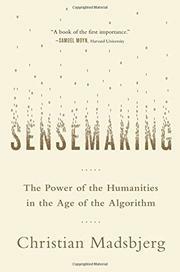 Certainly, some elements of sensemaking could also be termed by the less-innovative term “common sense.” Madsbjerg relates how faculty at the U.S. Naval Academy stopped teaching celestial navigation in the late 1990s after deciding to rely on satellite technology and GPS. In the past year, though, the academy has reinstituted the teaching of navigating by the stars. Why not use all available tools, combining them to guide a ship’s course? After offering dozens of interesting examples from the material world of corporations, Madsbjerg relates an especially memorable sensemaking study of how hostage negotiator Chris Voss relied on his humanities training to broker the release of journalist Jill Carroll from Iraq. The author employs jargon, to be sure, but he explains each piece of jargon with admirable clarity.